Rose pink standards and falls with darker rose borders and a lime green centre wash. Gorgeous. An unusual flower of purple/magenta on the petal edging on lime falls. Standards are a near white with pink and magenta blushed edges. Limited stock - 1 per customer. Details : Early - Mid. Ht 102cm / 40". 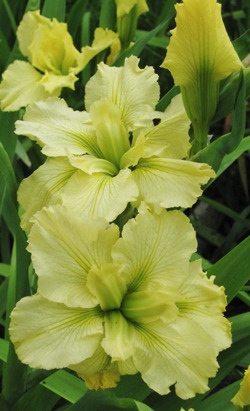 Bl 6"
NEW Release for 2014 - Exclusive to Rainbow Daylilies & Irises only. Lovely ruffled lilac falls and paler lilac ruffled standards. Yellow signals. A Vigorous and showy grower. Details : Ht 122cm Early - Mid season. Standards magenta mauve. Falls Magenta lilac with magenta style arms. Lime yellow signals. Exclusive to Rainbow Daylilies. A lovely bitone mix. Standards are cream with magenta veining and marbeling. Style arms yellow cream. Falls - violet burgundy. Yellow signals. Exclusive to Rainbow Daylilies. Lovely ruffled bitoned lilac lavender blooms with green and ivory styles. Falls are white with a lilac-lavender wash. Very large bitoned flowers of cream, heavily marbled irregularly in pink, purple, and dark purple. Limited stock. A bitone of pink magenta. Sometimes petals are marbled. Loads of ruffles. 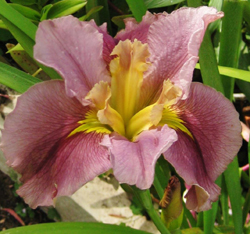 Huge blooms of ultra metallic mauve-plum with irregular white markings on some blooms a yellow line signal. Good grower. Lovely soft pink blooms with white rim, darker pinker veining. Lime-green signals with darker pink surround. Softest lemon style arms. Dainty bitoned blooms. Standards are cream edged lavender and veined brown. Stylearms are dark lavender tipped lavender-cream. 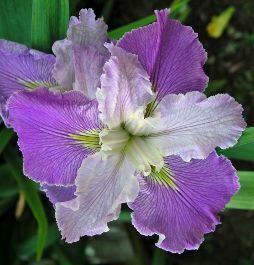 Falls are light lavender edged dark lavender and veined brown. Gold steeple signals outlined in brown. Nicely ruffled. Gorgeous large dusky pink blooms with darker veining and a yellow star centre. Fluted petals are wide and full. Unique colour. Limited stock. A delicate soft lavender bloom with each petal featuring a white rim. The style arms are a soft apple green. Delightful. Limited stock. Standards are soft lemon washed maroon-red. Falls are red washed yellow with deeper red veining and yellow splash signal. Lightly ruffled. Limited stock. Purple with a lighter edge and reverse. Standards are marbled lighter. Limited stock - 1 per customer. Peaches in Wine won the 1996 Mary Swords Debaillon Award. Standards are peach and the falls are deep red with a peach reverse and a lime-yellow signals. Gorgeous colour combination. Vigorous grower. A favourite. Rich mid blue blooms with a white spray pattern. Huge robust rhizomes. Details : Ht: 84cm. Mid season. Standards cream with pink edges. Style arms are cream lemon. Falls - cream with pink edges. Gold yellow signals. 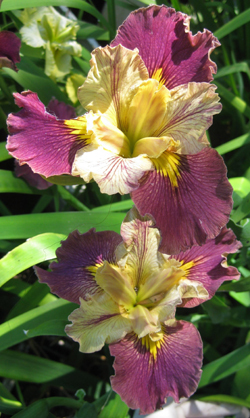 Exclusive to Rainbow Daylilies & Irises. Stds - smokey lilac mauve pink (smokey rose mauve). Falls smokey rose with darker centre of burgundy blend. Style arms lemon with beige mauve tips. Lime lemon signals with burgundy edge extends down to edge of petal centre. Gorgeously vibrant cyclamen-purple bloom with a white rim and reverse to all petals. The style arms are white and blushed pink when freshly opened. Limited supplies - 1 per customer. A lovely soft rose-pink self with a cream rim and reverse. Style arms are also rose pink. Ruffled and lovely. Details : 30" M Tet. 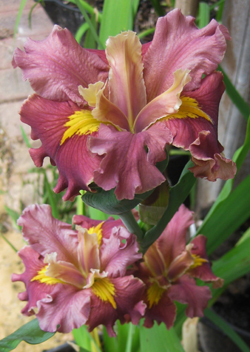 Huge blooms of deep wine red with rounded brilliant yellow thumb print signals. Styles are wine red and there is a fine wire edge of yellow . Details : Ht 65 cm. Mid- late season. 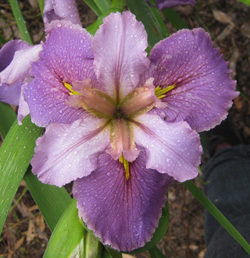 Sorry about the image will aim to get a better image this season, Bi-colour blooms of cobalt - Bishops violet standards. Orchid purple crimson falls. China rose edged cream style arms. Exclusive to Rainbow Daylilies. Ruffled elegant blooms with white standards, yellow falls with orange-yellow signals and yellow styles. Fluted, recurved and very ruffled. Semi erect standards. Limited stock. Mid purple with yellow green star centre and soft pink tufted styles. Rounded and ruffled. Limited stock. An elegant burgundy-purple bloom. Hardy and vigorous. Bright rose-red with a large brilliant sunburst pattern. Has a gorgeous glow to it. Small iridescent brick red blooms with a yellow lime signal. Limited stock. Gorgeous ruffled cherry red blooms with lemon midribs. Vigorous grower. Limited stock - 1 per customer. A tall mid gentian-blue with very little signal. Lovely show branching. Lovely colour. Limited stock. Vibrant ruffled lemon with green veining in throat. Style arms green with lemon frilled tips. Lemon Falls. Rosy shrimp red with large yellow signals. Large ruffled elegant dark ruby-red blooms with a lemon rim & reverse, A unique lemon/white spray pattern around a strong lime steeple signal on all petals. Style arms are lemon, tipped ruby-red. Quality bloom. Pink falls. Lemon standards that are edged in pink and ruffled. Style arms are a highly frilled lemon. Gorgeous! Limited stock. Details : Ht 38" (96cm) M-L Bl 5.5"
Falls are purple mauve with a grey tone, standards are slightly paler and ruffled. Lime green signals and style arms. Vigorous . Limited stock. Large deep purple with a fine white spray pattern overlay on each petal. Petals also feature a lime green line signal, white rim and reverse. The style arms are apple-green. Unique. Details : Mid Season. Ht: 38"
Details : Ht 88cm Mid- late season. A beautiful bi-colour bloom . Stds - pale violet lilac on white background. Violet lilac falls with a thin lilac pink edging. Lime green signals with crimson red edges. 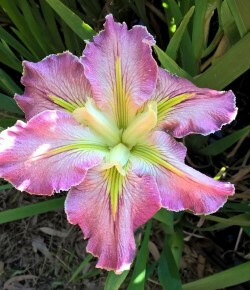 Exclusive to Rainbow Daylilies. Bitone blooms of violet falls with lime green signals. 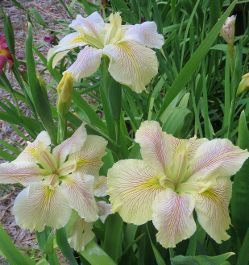 Standards are white with lilac pink blush veining. A large pure white with lime-green line signals on all petals. Pronounced fragrance. Lovely and ruffled. 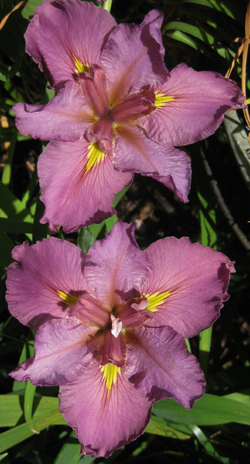 Standards are a soft pink-violet with a darker centre line. Styles are a darker pink-violet. Falls are pink violet with a lighter rim and yellow signals. Limited stock 1 per customer. Magenta Pink with a rich yellow signal. Pale edges in near white. Limited Stock 1 per customer. Light yellow standards and styles. Falls are lemon, heavily veined and suffused rose-purple. Flowers are variable - often with 4 floral parts.